While 2013 has been a pretty awesome year for movies and video games, on a personal level, it's been pretty crappy. What better way to send if off than with the latest beat up bundle of awesome from Hot Toys. 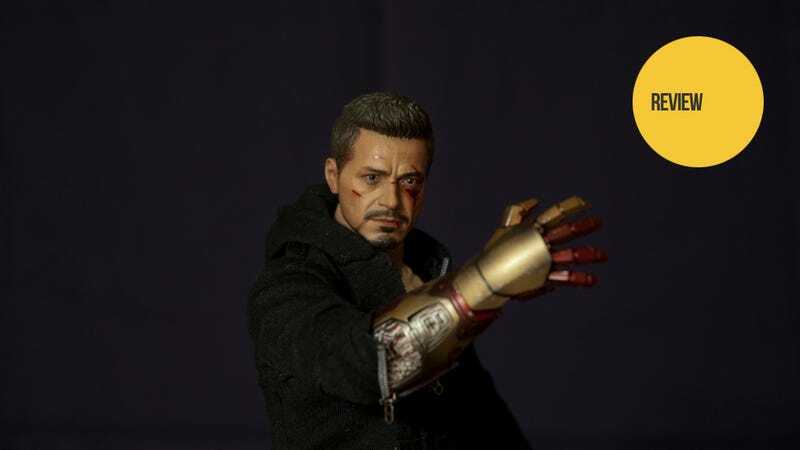 Straight out of last summer's blockbuster, Iron Man 3, is the un-suited Tony Stark in his Mandarin base invasion getup of home-made weaponry from Hong Kong collectible figurine developer/manufacturer, Hot Toys. Once again Hot Toys has gone all out in the little props, details, and gimmicks, allowing you to recreate the presumed-dead billionaire in all the scenes from his infiltration to his capture to his acrobatic escape. Newspaper with the headline "TONY STARK IS MISSING"
That Face – As always, Hot Toys does a spectacular job with the facial details, even if they're beaten and bloody. From the blemishes in the skin to the cuts and bruises on his face, it looks like Robert Downey Jr. just stepped out of the movie set. Part Iron Man, Part Tony – The interchangeable arm and leg are damn cool and add to the atmosphere of the figure. Granted, it's a feature that's been used before, but that doesn't make it any less cool. Accessories Galore – From the Christmas ornament bombs to the stun gun, Tony's arsenal works together as a collection to make the character that is The Mechanic. The Clothes Make The Man – Tony's down-to-Earth hoodie and jeans are a fine specimen of miniature costume design. He may be bloody, his armor may be broken, but he still looks sharp and in style. Mobility – One of the problems many Hot Toys figures often face is the loss of mobility for the sake of recreating the look of a character. Rubber suits and armor often limit what kind of poses you can make a character stand in. This is very much not the case here. While you can't exactly have Mr. Stark doing yoga, the freedom his flexibility offers is quite nice. Fragile – Perhaps it's just the figure I got, but Tony's elbows were very stiff. While his arms do bend, I had to apply quite a bit of pressure to get them to, which constantly had me worried that I might snap the figure's limbs off. A bit of caution is probably required in this area. Also, part of the Mark XLII leg armor popped off when fitting it on. It was nothing a dab of superglue couldn't fix, but it still warranted some extra caution. Hairpiece – Yeah, it's a nitpick, but it's a bit of a shame when the faces are so amazingly detailed only to have the hair be a hard plastic piece. There's not much than can be done about this without making the price tag take a leap into the stratosphere so I generally let it slide. But it's still something I think about. Honestly, whatever you may think about the movie – and I've heard no end to issues people had – this figure is just damn cool. At least my year ended on a high note. Tony Stark (The Mechanic) is currently being sold in the west through Sideshow Collectibles. As of this article, it's still available (and pretty expensive).